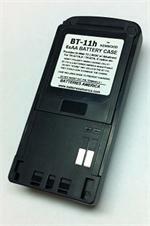 BT-11h : 6 x AA battery case for Kenwood TH-D7A, TH-G71A, TH-D7E, etc. BT-11h : 6xAA Alkaline Battery Case for KENWOOD radios. Fits the TH-G71, TH-G71A, TH-G71E, TH-D7, TH-D7A, TH-D7E, etc. (all worldwide models). Provides 9VDC with 6 Alkaline batteries, for high-watt Transmit capability. Designed by BATTERIES AMERICA, this case holds 2 more batteries than the original Kenwood BT-11 case ! CP-39 : 12VDC Power Cord for Kenwood TH-D7A, TH-D7E, & TH-G71 radios. CP-39 : DC Power & Charge Cord for KENWOOD radios. Fits the TH-D7A, TH-D7E, TH-G71, TH-G71A, etc (all worldwide versions). CBE-39: mobile Battery Eliminator for Kenwood TH-D7A, TH-G71A, TH-D7E, etc. CBE-39: Battery Eliminator for KENWOOD radios such as TH-D7A, TH-G71A, TH-D7E, TH-G71, TH-G71AK, TH-D7G. Provides Hi-Watt operation froma vehicle or portable 12VDC power source. PB-39 : 9.6 volt 1200mAh LONG LIFE Ni-MH battery pack for KENWOOD HTs. The PB-39 Ni-MH is a 9.6 volt 1200mAh Nickel Hydride rechargeable battery pack for KENWOOD radios such as TH-G71A, TH-G71E, TH-D7A, TH-D7E, etc. Provides High-Watt TX power. Includes heavy-duty spring-loaded belt clip. EMS-30K: Rapid-Smart charger for KENWOOD batteries (PB-39, PB-39N, PB-39H, etc). 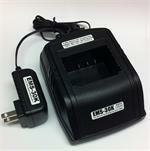 EMS-30K: Desktop Rapid Charger for Kenwood-style PB-39 & PB-38 batteries (both Ni-Cd & Ni-MH). Charges battery alone, OR with radio attached. Automatically switches to float charge when battery is full. PB-39h : 9.6 volt 1450mAh Hi-watt Ni-MH battery for KENWOOD TH-D7A, TH-G71A, etc. PB-39h : 9.6 volt 1450mAh rechargeable Ni-MH battery for KENWOOD. Fits the TH-D7A, TH-D7AT, TH-D7E, TH-G71, TH-G71A, etc. Newly-designed ULTRA LONG LIFE BATTERY! Comes with heavy-duty belt clip.